The eclectic music style of Dang Show comes from the creative combination of Piano, Saxophone, Vocals and Percussions. 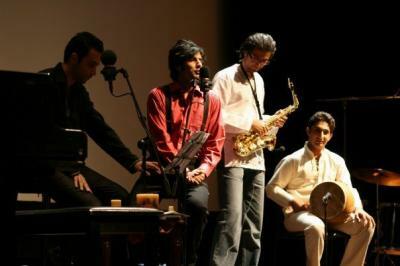 The band has performed numerous times in Tehran to sold out audiences, including the opening ceremony of the International Fajr Film Festival, and a 3 day charity concert for Mahak (The Society to Support Children Suffering from Cancer ), Jashne Tasvir the largest photography exhibition in Iran, and Khane Cinema, the home of the Iranian Movie Industry. They have composed and recorded soundtracks for over 10 major Iranian movie releases , including “I, ran and ran”, the last film directed by Kamal Tabrizi , and “The Gardens of Kandeloos” directed by Iraj Karimi. Internationally, they have performed for the 60th Anniversary of Thailand’s Monarchy at the hospital where the 80 year-old King of Thailand was hospitalized. They have also performed at the International Winter Festival in Sarajevo and received overwhelming praise from the media. Dang Show is managed by Samad Talehghani.